Opening hours: General opening hours are 9am–2pm and 5pm–8pm or 9pm on weekdays. Some shops stay open during the siesta (2pm-5pm). Banks are open 8am-2pm. There is so much more to do in Mallorca than party and soak up the sun (but be sure to indulge in some of that too). 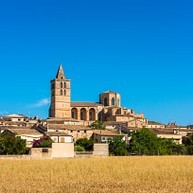 Explore historical and impressive Palma, visit tiny coastal villages and remote mountain monasteries, hike the Serra de Tramuntana, take a dip in any of the picturesque coves surrounding the island, or go wine testing in Binissalem Wine Village. 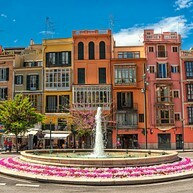 Mallorca offers a truly notable variety of sights and activities, and those who take the time to explore this small and very manageable island in depth will be greatly rewarded. 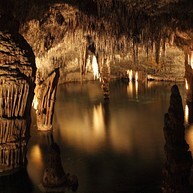 Cuevas del Drach is an impressive and beautiful network of caves located in an old fishing village called Porto Cristo, around 65 kilometres from Palma. The caves are two kilometres long and thousands upon thousands of amazing stalagmites and stalactites are spread across the three chambers. Guided tours take around one hour. Fishing nets glisten brightly in Mediterranean blue as they lie out to dry on the quayside. Behind the nets you can catch sight of the stock exchange building, La Lonja, dating from 1388. The place where locals now sip their coffee was where most of the Mediterranean area’s trade was handled during the Middle Ages. The whole city oozes history out of every building and street corner. A bustling city, the island's capital never fails to surprise and impress all who visit. 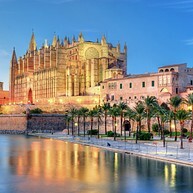 This imposing Gothic cathedral stands tall atop the old Roman and Renaissance city walls, looking out over Palma's harbour and old town. It was built over hundreds of years on the ruins of the mosque that once stood there. Famous Catalan architect Antoni Gaudí had a hand in the restoration project early in the 20th century, though he quit over a dispute with the contractor. This beautiful architectural wonder offers breathtaking views in every direction, and is the perfect starting point for a walking tour through the city. The narrow lanes and alleyways of the Old Town echo with centuries of sea-faring, intercontinental trade and intercultural encounters. Take a stroll around one of the largest areas of ancient buildings in Europe, cast your eyes over the spruced-up palaces and visit the luxury hotels, shops and bars. Dizzying twisting roads and dramatic cliffs, north-west Mallorca is wild and beautiful. People crowd the vantage points along the road to photograph this beautiful cape that locals call the "meeting point of the winds." High mountains and deep valleys frame Valldemossa, the village where the island’s two first “celebrity tourists” (composer Frederic Chopin and authoress George Sand) lived in 1838. At the monastery, all the monks' cells are lined up, each with its own exit to the garden terrace with blossoming magnolias and a wonderful view over the valley. Tasting some of Mallorca’s award-winning wines at José Louis Ferrer and the other many bodegas is a feast for the senses. During the Wine Festival in September, Binissalem is just one long table laden with wine and food. 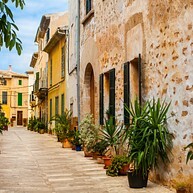 Right in the centre of Mallorca lies Sineu, the island's oldest village. For over a thousand years, farmers have been coming to this unbearably picturesque town with their cows, bulls, horses, sheep, mules, ducks, hens and swans to market each Wednesday. Extremely popular among nature lovers, this mountain range sprawls along Mallorca's northwest coast, offering one breathtaking vista after another and the island's best trails for hiking and mountain-biking. The inhabitants of this idyllic village lived for centuries hidden in a valley behind a huge row of mountains. It was so hard to climb the mountain chain that people preferred to go to Palma by boat. And if they were on a boat anyway, why not go to France? Soller became tri-lingual—Mallorcan, Spanish and French. In 1911 a tunnel was dug through the mountains, so the people of Soller could finally have better access to their own island. The town's wonderful little train still runs today. Cala d'Or is a medium-sized and cosy resort-town located 65 kilometres east of Palma. The city has seven picturesque bays where you can enjoy the sun and beach. This is a very popular destination among Europeans and families with children. The town provides plenty of restaurants and bars, most of them located in the centre of Cala d'Or. Bellver Castle is a well-preserved 14th century royal fortress with an amazing view over Palma Bay. For many centuries the castle was used as a prison and now it is one of the main tourist attractions on the island. The castle also houses the Palma History Museum where you can learn more about the island's rich heritage. 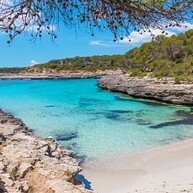 Mondragó Natural Park is located on Mallorca's South East coast, centred around two large bays famous for their fine white sandy beaches and the amazing turquoise blue sea. The animal life in the Mondragó Natural Park is extremely varied, and it is a good place to see migrating birds. Its 14km-long beach makes Alcudia one of the island's most popular tourist destinations, especially among families. But the city also has a lovely Old Town with picturesque narrow winding streets and beautiful old buildings, giving a real feeling of life in the old days. 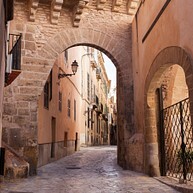 Casal Solleric is a wonderful 18th century Baroque building located in the heart of Palma. It houses temporary exhibitions specialising in contemporary art and photography. The interior has a beautiful courtyard with amazing decorations, and there is also a small cafeteria. This three-hour tour on a road train stops at some of Mallorca's famous vineyards (including the island's oldest winery), where visitors get the chance to try some delicious local vintages. 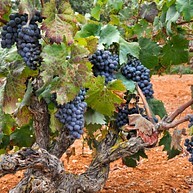 While visiting the wineries the able tour guide lets participants in on the secrets of Mallorca’s wine culture.